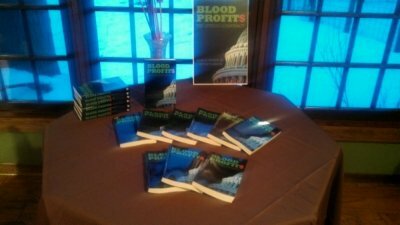 Blood Profit$ is an epic tale of an American David and Goliath confrontation. Julia Abbott, a diminutive Iraq war hero from Montana seeks justice for a war crime she feels she committed on her country's behalf. AJ Morales, an Afghanistan veteran whose father was unjustly ruined through political mudslinging seeks revenge against three corrupt US Senators. Charlie Prendergast, son of the head of the US Joint Chiefs of Staff, a former college quarterback crippled in a Mafia fixed college football game, betrays his best friend with a Mafia princess. Each has been manipulated and scarred by a collusion of highly placed politicians, international organized crime, and Wall Street money laundering schemes. The debt ridden US taxpayer, daily cheated out of billions in tax dollars from unjustifiable Asian wars controlled by the ever growing US Government, seems indifferent to the now blatant exploitation. Nicola Scozzari, Mafia financial wizard, in control of corrupt politicians and behind the scenes owner of a military funded private contractor corporation, illegally mines lithium in Afghanistan, the operation funded by the US taxpayer and protected by his private army of ex-military mercenaries. Yet risking the ultimate sacrifice, an unlikely trio will come together forged by a pact to restore the spirit of the America Dream. Their quest will take them from war ravaged Iraq to the protected poppy fields of Afghanistan, into the lithium mines of Bolivia, to the smoke filled backrooms of the policy making power elite of Washington D.C. then deep into the internal workings of the drug smuggling American Mafia - where all that matters is power for personal gain.